I started this website to help those of you out there who are struggling to find meals for your mixed diet family. Sometimes I am able to show you things both my (very picky) carnivore and I eat, and sometimes I can't. Because, the truth is he hasn't given up bacon and I haven't given up cucumbers. When you are making meals work for everyone, you can't just cook things that everyone will eat. And you shouldn't. I usually reserve my more exotic experiments for my lunch. I share my concoctions with the baby, but I don't force them on the carnivore. It is not fun to fix food and have someone gag while they eat it or just push it around their plate. 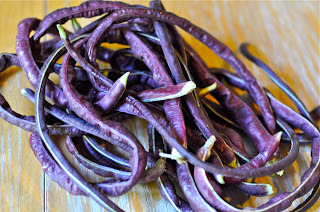 So, when these purple yard beans showed up in our CSA recently I figured I would be the prime beneficiary or their bounty. I decided they would be great in a cool bean and potato salad. Start by cleaning and quartering the potatoes. Boil them til tender. Cut the beans in one inch pieces and trim the ends off. Stem the beans for a few minutes - until slightly cooked, but still crunchy. Once ready allow the potatoes and beans to cool on the counter. Dice the tomato and toss with oil and juice from lemon. Toss in potatoes and beans. Salt and pepper to taste. Top with fresh chopped parsley. Place in refrigerator for at least an hour (the longer the better). The colors were beautiful and the salad was satisfying. It was nice to have something cool on these dog days of summer that was substantial and still fresh. And while my carnivore would never touch it, maybe yours would or maybe they won't. But, food for me is about love and I heart this purple salad. Sounds delicious! I didn't know what "purple yard beans" were until I googled them -- I have never seen them where I live but I expect that regular green beans would work just as well (maybe not so pretty though)! Think I'll try it! They are both pretty & tasty, but I think regular beans would work fine. 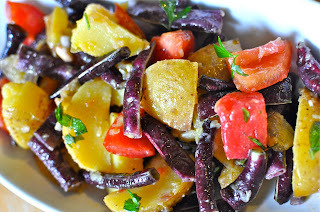 I am really interested in the beans , do you know the name of the variety ? we live in France but I may be able to find them on the net . I love your blog as one half of a blended duo it is good to see how other people cope , I am lucky that my husband is not a fussy eater he always says he is just grateful to get fed . I wish I knew more about them. They came from our CSA and didn't have any info with them. 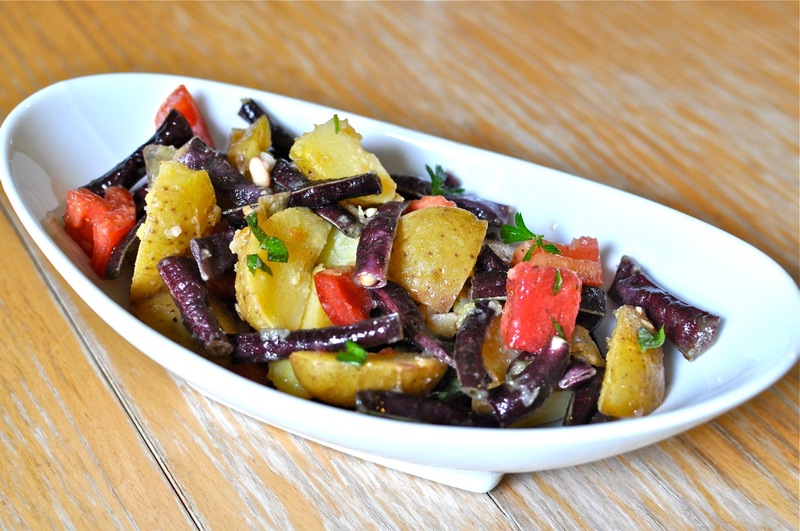 They had a stronger taste than green beans and a tougher texture, but they gave a great earthy flavor to this salad. What a great idea this recipie looks great! !